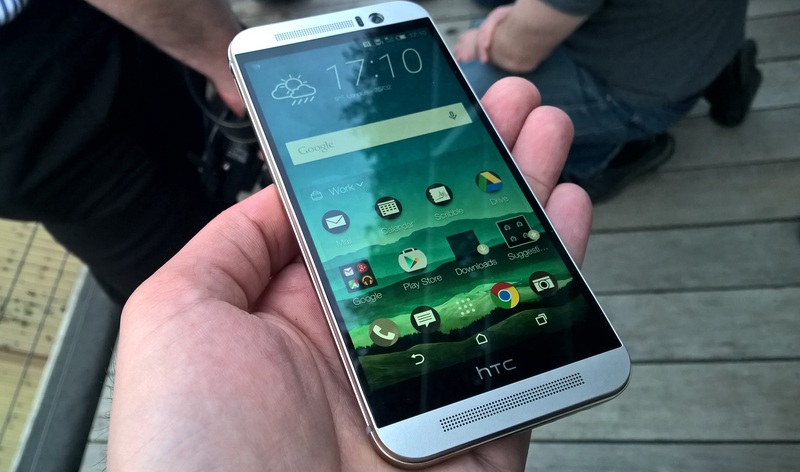 HTC has today officially unveiled its flagship smartphone for the coming year: the HTC One M9. Following HTC’s One M7 and One M8, the naming convention for the One M9 comes as no surprise. It’s not just the name that’s kept to the same formula, either. The newest HTC One keeps the same single-piece approach for its scratch resistant metal chassis, except this time around there’s a subtly-colored band running around the side of the handset. It’s so subtle, in fact, that you might not be able to see it. Hardware-wise, the One M9 has a 5-inch full HD display, octocore Qualcomm 810 Snapdragon processor, 3GB RAM, 32GB internal storage and a 4 ‘UltraPixel’ front-facing camera. To bulk up that storage a little, there’s also 100GB of Google Drive storage space included with the M9. On the rear, however, HTC has ditched the UltraPixel setup and put a 20-megapixel sensor and dual-LED flash. It does use the same autofocus exposure algorithm as the front-facing snapper, which, HTC says, helps it to take more detailed photos in low-light conditions. Of course, in ditching the UltraPixel rear camera, HTC has also dropped the additional spatial imaging sensor found in the M8, but that’s not such a bad thing, given the slightly gimmicky results it produced. The company has once again focused on sound and media playback for the M9, so you’ll still find dual front-facing speakers and a high-res display for your images, movies and gaming. The BoomSound speakers also support Dolby for a deeper sound this time around, and you’ll also get Dolby when using the audio jack socket, as well as the speakers. There’s also support for 24-bit encoded tracks. This change from Beats to Dolby isn’t surprising though, given Apple’s purchase of the audio company last year. 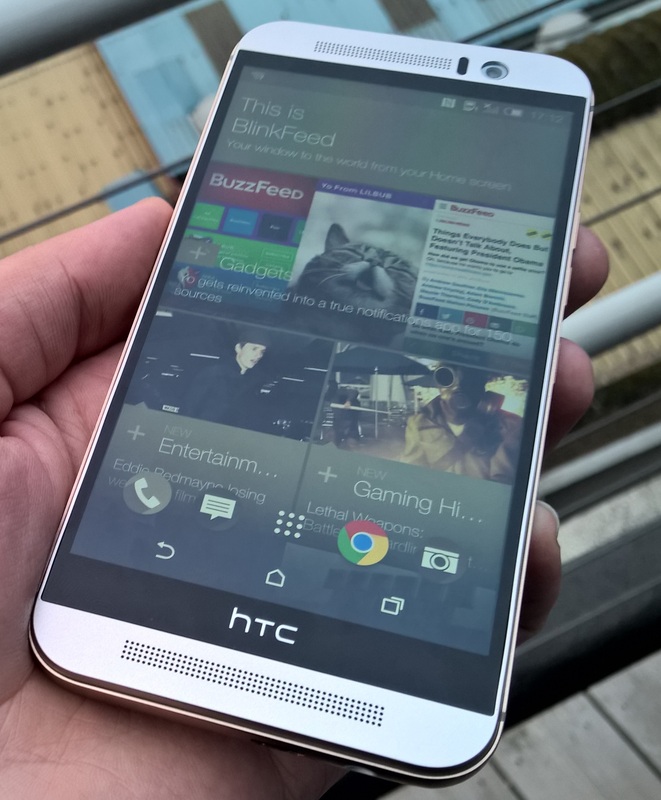 Alongside the introduction of the M9, HTC also used the launch to show off its new Sense 7 UI. 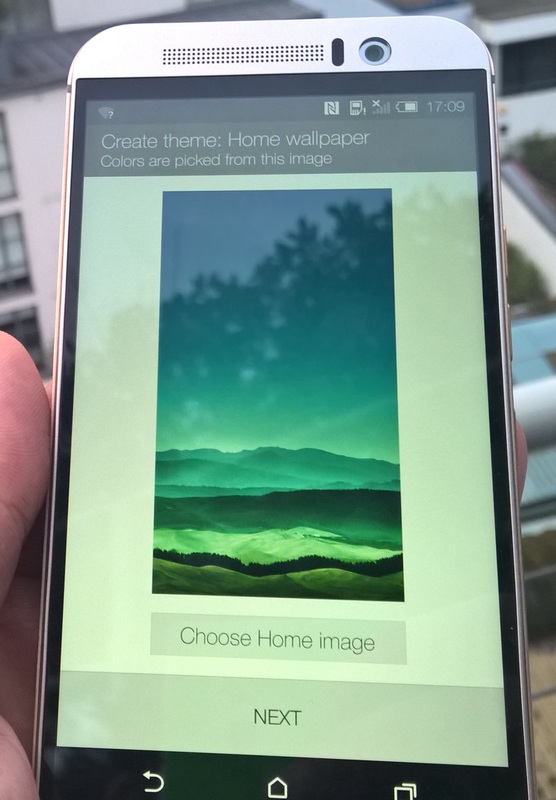 One of the key themes for Sense 7 is personalization, so you’ll now find a theme generator on board. This allows you to use a photo you’ve taken (or not) to create a custom theme; the generator analyzes the image to make suggestions for the overall system theme. Although the suggestions are automated, you can still edit any of the options. The HTC Sense Home launcher uses context-sensitive information to display different apps and functions based on things like your location and the time of day. A spokesperson said this feature doesn’t need to be manually setup, as such, it’ll just start learning which apps you use most frequently in certain places. Alternatively, you can manually pin specific apps to appear when you’re in a specific location. Things like the lock screen and BlinkFeed can now show context-sensitive information too. Among the other Sense 7 tweaks, you’ll also now find a new OneGallery app designed to make it easier to keep track of your photos spread across different devices and cloud storage services. To do this, it plugs into your existing services and downloads a thumbnail of each image (to save space) to your phone. Once all your photos are in OneGallery, they’re editable and searchable by tag, date and image. HTC said the One M9 will go on sale from March 31 in a number of markets, including Europe and the US. What it didn’t say, however, was how much it will cost. Nonetheless, you can expect it to be safely in ‘premium’ territory. Color-wise, it’s being offered in silver with a light gold sidewall, gunmetal grey with a mirrored grey banding and gold on gold. Check back for our review in the near future.